Dog harnesses, leashes and collars are important for taking your dog for walks, hikes or runs. When you and your pet are ready to really go and play, you might need gear for a more active lifestyle. Here are some great dog accessories for active pet lovers. While most dogs can swim, some simply don’t do well in the water. Some breeds like bulldogs aren’t made for swimming. Older dogs, no matter the breed, can struggle, as well. A dog life jacket or vest that fits correctly can help keep your dog’s head above the water, even if fatigue, injury or another problem is making it difficult for your pet to swim. And it can make swimming easier and more fun for dogs that love to get wet. 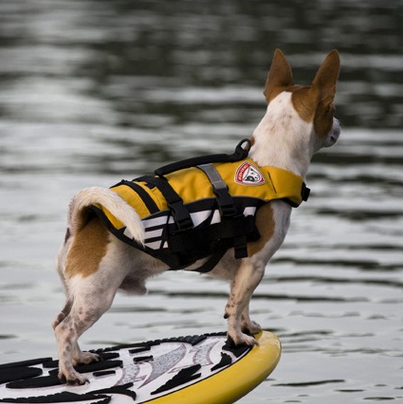 You can purchase small life preservers like the Micro Doggy Flotation Device that’s designed in three sizes to properly fit dogs under 15 pounds. This keeps smaller dogs from being in danger of slipping out of a larger dog PDF that doesn’t fit properly. Basic dog bowls for daily food and water are an obvious must. But what about when you take your pet on the go? Do you really need to pack bulky pet dishes just to give your dog something to drink? Unless you want to pour water and try to hydrate your dog by letting him drink from the stream, which isn’t even something all dogs can easily do, you’ll need something to hold his drinking water. EzyDog’s Fold-A-Bowl is the answer. The bowl folds into a flat rectangle you can easily carry on your belt or in a pack. Simply unfold the bowl inside out and fill with food or water. Shake it out when your pet’s done, and the quick-dry material lets you fold it almost immediately so you can take off again. At EzyDog, you can choose the redesigned Element Jacket for protecting your pet from wind and rain, and it’s built specifically for cold-weather wearing. The Element Jacket will help keep your pet comfortable on windy, rainy days when you brave the weather to get outside and play, and protect him from snow, ice and cold for winter fun. 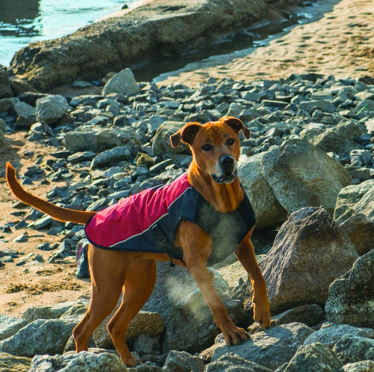 This jacket is ideal if you and your pet plan to enjoy the outdoors for any length of time. For the adventurous pup, the Summit Backpack comes in four sizes to fit properly. The award-winning chest plate holds the pack on comfortably, while the side pouches let your pet carry his own accessories, like snacks, water and a Fold-A-Bowl. The backpack is great for carrying light gear and letting your pet get a little extra exercise. It can also be a calming presence for dogs who tend to pull against their leashes. Enjoy these great outdoor dog accessories with your pet today, and don’t forget to check out EzyDog’s fantastic line of engaging dog products.